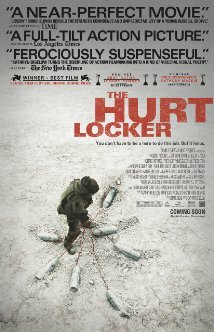 Synopsis: During the Iraq War, a Sergeant recently assigned to an army bomb squad is put at odds with his squad mates due to his maverick way of handling his work. Did You Know? Kathryn Bigelow’s victory makes her the first and so far only woman to win the Oscar for Best Director. Quotables: SFC JAMES: Everyone’s a coward about something. I really like this movie, despite its many mistakes. However the one that I cannot overlook is Jeremy Renner’s character is called Staff Sergeant James, but in every scene he is wearing the rank of Sergeant First Class, which is one rank above Staff Sergeant. Then there’s LTC Cambridge, who wears two flag patches on his uniform. You only wear one. But I can disregard all of the errors, because the film is so suspenseful.